Good Life Connoisseur | Why Graphite? Home » FEATURED » Why Graphite? 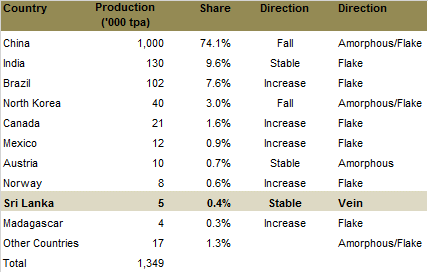 Graphite is one of the more interesting under the radar minerals or commodities, at least from an investment standpoint, as there are few late stage development stocks on the markets today. Graphite is a widely used mineral today, whose demand is poised to increase significantly through new applications that are emerging and expected to come on-line in the coming years. It remains a speculative slice of the overall public mining landscape that is expected to change in the next 1-3 years for several graphite stocks, provided they remain on schedule. Graphite is one of only two naturally formed polymers of carbon, the other is a diamond. It has properties that are found in both metals and non-metals, allowing it to be suitable for a wide range of applications. Graphite has the highest strength and stiffness of any material while also being one of the lightest of all reinforcing agents. It is also an excellent conductor of heat and electricity and maintains most of its properties at very high temperatures (i.e. in excess of 3,500oC). Moreover, its flakes can easily slip over one another, which results in a greasy texture that makes it a useful lubricant. This wide range of desirable, and often unique properties, has resulted in graphite currently having almost 200 established uses. 1) Amorphous: This is the most abundant form and has the lowest purity and is typically supplied for low grade uses. The purity ranges from 70-80% carbon after refining. Amorphous graphite is formed by the metamorphism of previously existing anthracite coal seams. 2) Flake: A less common form that has a higher purity than amorphous. The purity can range from 85-95% carbon after refining. Flake graphite can fetch prices that are up to 4 times higher than the amorphous variety. Also, unlike amorphous, flake graphite is suitable for many of the emerging uses of graphite. It is is formed in metamorphic rocks or calcareous sedimentary rocks. 3) Vein: This is the rarest and most valuable form of graphite. It has a purity of 95-99% carbon without refining. Vein graphite has higher thermal and electrical conductivity than less pure forms, and also has the highest degree of cohesive integrity. It can also be more easily molded into solid shapes without the aid of binder additions, which can result in cost savings over amorphous and flake graphite. Naturally, it also garners the highest prices in the market. Vein graphite is only extracted/produced in Sri Lanka at this time in tangible quantities—although it represents a very small percentage of the overall global supply. It is formed from the direct deposition of solid, graphitic carbon from subterranean, high temperature fluids. The demand for graphite is driven by industrial applications, specifically the continued industrialization of emerging economies such as China and India. The size of the market is approximately $12 billion with amorphous, representing 60% of the supply and flake, representing the remaining 40%. Global consumption was around 1.1m tonnes in 2011. By this measurement, the graphite market is almost as big as the nickel market and several multiples larger than the lithium and rare earth markets combined. The lithium and rare earth markets have more mature public companies so they have garnered more attention and value in the junior mining space vs. their graphite counterparts. Five countries control about 97% of the world production of graphite. China alone has about 74% of total production. The majority of China’s supply comes from small scale producers that supply lower grade graphite, resulting in the country representing 90% of the world’s amorphous production and 60% of the flake production. Current: Refractory uses and the steel industry are the largest consumers of naturally occurring graphite. In refractory applications, graphite’s lubricity and thermal conductivity is exploited in high temperature applications to produce crucibles, alumina-graphite shapes, carbon-magnetite bricks and gunning mixtures. In the steel industry, graphite is used to increase the natural carbon content of steel. Lower grade graphite such as amorphous or fine flake can be used in brake linings, gaskets, and clutch materials in the automotive sector. Other uses include foundry facings, where low grade graphite is added to water based paint. It is then applied to the inside of a mold so the cast object can be more easily removed once the metal has cooled. 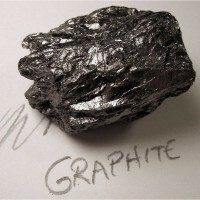 Emerging: Certain emerging uses of graphite have the potential to dwarf current uses of graphite in the next few years. These are mostly clean technology applications, which is a sector I spend most of my time working in. The most compelling emerging use is in lithium ion batteries (also used in other types of energy storage devices/batteries). Lithium and rare earth stocks have ridden this expected increase in lithium ion battery use in recent years. To a lesser extent, so have a few select graphite stocks. That being said, there is between 10 to 20 times more graphite than lithium in these batteries. In other words, a typical hybrid car needs over 10kg of graphite whereas a fully electric car can use over 100kg of graphite. This has to do with most battery designs requiring an anode that is made of a porous carbon material. Moreover, only flake graphite, which represents 40% of current supplies, is suitable for this application. Therefore, if electrified drivetrain adoption and decreasing lithium battery prices continue to occur, additional graphite supplies will be needed between now and 2020 to satisfy the demand for this application alone. Other emerging uses include lower cost solar panels and pebble bed nuclear reactor. China has the first prototype of the pebble bed nuclear reactor in operation, and could build up to 30 more by 2020. These reactors need 300 tonnes of graphite to start and another 60-100 tonnes per year to operate. Further out, a new type of material is being developed called graphene. It is 200 times stronger than steel and even several times stronger than diamonds. It is also very light and can be stretched like rubber. It can achieve these unique properties while possessing the ability to conduct heat and electricity better than copper. Initial commercial roll-outs of this material could be seen as early as 2015/2016. Unlike base and precious metals, where there is a set market price for all purchasers, prices for industrial minerals such as graphite can vary greatly. 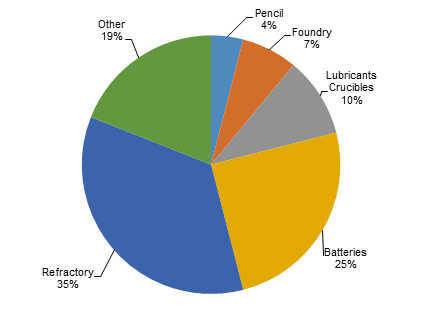 Graphite prices are highly dependent on flake size and purity. In the 1990’s there was a large decline in the overall prices of graphite, as China dumped significant quantities onto the world market. We do not expect China’s actions from the 1990’s to be repeated. In addition to new uses for graphite, China has been shutting down older and smaller mines on the grounds of environmental violations and tightening labor conditions. Furthermore, the closing of these sites are the result of mines getting deeper and older. In more recent years, emerging markets such as China (now with a 20% export duty) and India have been holding back supplies for domestic consumption where the pace of industrialization has greatly outpaced the global averages. This factor coupled with the rise in lithium and rare earth prices, has led to a corresponding spike in graphite prices between 2009 and 2012. In the last year plus, the prices have retreated as the economies in these emerging markets have slowed down, along with the general retreat in the overall mining sector.